Family Gateway hosts 2nd Annual DAY TO PLAY Family Fundraiser, Highlighting the Importance of Play & Community Service, While Benefiting Families Affected By Homeless. The Miltenberger Family of Dallas will be honored with Family Gateway’s Inaugural ANNETTE G. STRAUSS COMMUNITY SERVICE AWARD for their ongoing commitment to help families in need. 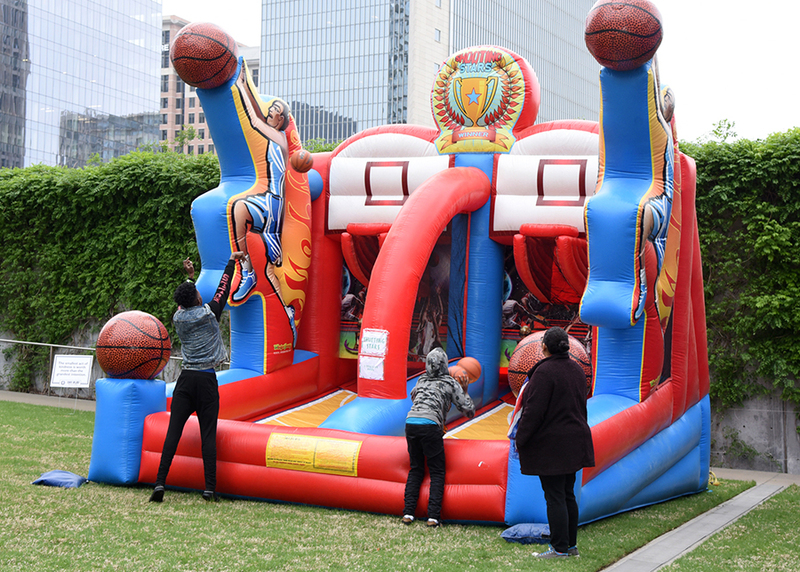 Family Gateway will host its 2nd annual family fundraiser, DAY to PLAY, on Saturday, April 27, 2019, from 11 a.m. – 2 p.m., at AT&T Performing Arts Center’s Annette Strauss Artist Square. DAY to PLAY brings families together for a day filled with activities and discoveries geared toward children. From lawn games and yoga to live music and crafts, entertainment will be paired with a focus on volunteerism and community service, including a basic overview of the scope of families who are experiencing or are near homelessness in Dallas. During the event Family Gateway will present its inaugural Annette G. Strauss Community Service Award to the Miltenberger family for their tireless service to families affected by homelessness. The late Annette Strauss, former Dallas mayor, was the founder of Family Gateway. Event Co-Chairs are Jen Fahrenbruch, Jennifer Hull, and Mandy Main and Honorary Chair is Stephen Hipp. Highlights include: Music by DJ Kaivan “KB” Bazleh and kids’ DJ lessons from OontzKids; a live performance by singer, dancer, and HeARTS of Maya founder Maya Delgado; group yoga by Hanuman Homies; bounce houses; inflatable slides, and much more! Interactive booths by nonprofit partners offering education, outreach and volunteer opportunities for children include Capes for Kindness, Dallas Zoo, Hanuman Homies, HeARTS of Maya, Kids Helping Kids, National Charity League, Promise of Peace Gardens, Wee Volunteer and more. Exhibitor booths by area businesses catering to kids include Explore Horizons, OontzKids and Raising Cane’s. Kid friendly concessions and beverages (including beer, wine, and champagne for adults) will be available for purchase through Wolfgang Puck Catering. The Miltenberger family, Family Gateway’s inaugural recipient of the Annette G. Strauss Community Service Award, first became involved with the nonprofit in 2009, when they prepared a shelter room at the Annette G. Strauss Family Gateway Center for a new family’s arrival. In 2011, they organized the “adoption” of 75 families during the holidays and have been deeply involved in the holiday program ever since, organizing donation drives and volunteering in the Holiday Store. In conjunction with a generous group of friends, they ensure dozens of kids get to attend summer camp at Kids Across America Kamp in Missouri. Paula co-chaired the Gateway to Opportunity Luncheon in 2016 and 2017 and now serves on the board of directors. Bay, a former member of the board of directors, now sits on Family Gateway’s Affordable Housing Board. The entire family continues to work tirelessly, from serving meals and organizing donation drives to connecting their networks to the nonprofit’s mission. “We are honored that Family Gateway has created the Annette G. Strauss Community Service Award in recognition of our mother’s long history and involvement with this organization that she founded,” said Nancy Strauss Halbreich. “It will be exciting to see this honor presented to a family each year at DAY to PLAY, recognizing the many young community leaders who are truly making an impact,” added Janie Strauss McGarr. Sponsors to date include: Field Day ($10,000) – Mandy and Clayton Main, Marilee and Charlie O’Connell, TurningPoint Foundation, Amy Warren;Rainbow ($5,000) – Janese and Rick Deitch, Stephen Hipp and Brian Rogers, Jennifer and David Hull, Renovo Capital, LLC, Texas Capital Bank; Sunshine ($2,500) – Cinemark, The Dallas Stars Foundation, Evolution Spine, The Frymire Family, Goldberg & Croft Family, Ellen and Rick Magnis, Paula and Bay Miltenberger, Nichols Family Foundation, Brittany and Jamize Olawale; Fun & Games ($1,000) – Jen and Jeff Fahrenbruch, Anne and Nathan Johnson, Minda and Gary Moor, Sandy Nachman, Gowri and Alex NK Sharma, Exa and David Whiteman; Picnic ($500) – Carmen and Gary Barrett, Chad J. Bieber and Robert William Ivey, Biewenga/Cutshall Family, Ashley and Mike Blurton, Kristy and Taylor Bowen, Michelle and Chris Dupre, Lindsey and Jonathan Dyer, Alisa and Steve Ellis/Layette, EyeMax Optical, Kerri and Charlie Gale, Sallie and Cavan Groves, HALL Group, Juanita Harris, Harris Orthodontics, April and Cory Henegar, Kessler Collins P.C., Mirjam and Chris Kirk, Elizabeth and Patrick Malone, Meg and Troy Manson, Christy and David McAtee, Kelly and Jeff Miller, The Brian Moore Family, Morales Family, Susan Hensarling Nahkunst, The Naudo Family, Alexis and Andy O’Connell, Amanda and Charlie Shufeldt, The Scowden Family, Libby and Jacob Smith, Lauren Soulis and Tim Burns, Meghann and Matt Strickland, The Waters Family, Leslie and Geoff Wayne, The Wentworth Family, Jamie and Trey Whatley, and Sarah Katherine and John Zavala. Print sponsor is DFW Child. Digital media sponsor is My Sweet Charity. Proceeds from DAY to PLAY will support Family Gateway’s mission to provide stability and life-changing supportive services to children and families affected by homelessness in Dallas. The interventions Family Gateway provides give children the chance to build resiliency and competence to break the detrimental cycle of homelessness. Last year, the agency served an unprecedented 1,422 families. Family Gateway is unique in that many shelters have restrictions on what constitutes a family. At Family Gateway, single parents with children, families with older male children, multi-generational families, families with same gender parents – all are welcome. Family Gateway keeps families together and works with them as they are. About Family Gateway – As the county-wide point of entry (access point) for families with children experiencing or near homelessness, Family Gateway believes in providing housing first and then using trauma-informed services to help break the cycle of poverty. The mission of Family Gateway is to provide stability and life-changing supportive services to children and families affected by homelessness. For more information, visit www.familygateway.org.